Orion stands in the south-west at nightfall as the sparkling skies of winter give way to the less flamboyant constellations of spring, led by Leo and Virgo. By our map times, Orion has mostly set the west and the Milky Way arcs only some 30° above Edinburgh’s north-western horizon as it flows between Auriga and the “W” formation of Cassiopeia. The Milky Way, of course, marks the plane of our disk-shaped galaxy, itself dubbed the Milky Way, around which our Sun orbits every 240 million years. If we look along it, we encounter numerous distant stars but countless more are forever hidden from sight behind intervening clouds of gas and dust – the raw material from which new stars and planets may eventually coalesce. If we gaze in directions away from the plane of the Milky Way, though, the star numbers fall away and there is negligible gas and dust to hide our view of galaxies far beyond our own. It follows that we might expect our best view of the distant universe to be in directions at right angles to the plane, towards the galactic poles. Regions around the North Galactic Pole are ideally placed in our April evening sky and host some of the most interesting clusters of galaxies in the entire sky. The pole itself lies in the less-than-startling Coma Berenices which is approaching the high meridian at our map times. As the only modern constellation named for a historic person, this celebrates Queen Berenice II of Egypt who is said to have sacrificed her long hair as an offering to Aphrodite. Her tresses are represented by a cascade of stars that spill southwards through the “M” of “COMA” on the chart. 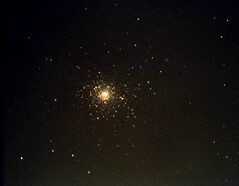 These make up a dispersed but nearby star cluster at a distance of about 280 light years – the second closest star cluster after the Hyades in Taurus. Roughly coincident with the “C” of “COMA” is another cluster, but this one of more than 1,000 galaxies at a distance of some 320 million light years. The Coma Cluster’s brightest galaxies are only around the twelfth magnitude and, as such, a challenge for many amateur telescopes. It was by studying this cluster that the Swiss astronomer Fritz Zwicky uncovered evidence as long ago as 1933 for the existence of what we now call dark matter. He found its galaxies were simply moving too fast to be held together unless addition material was present to supply an extra gravitational pull. Now we suspect that up to 90% of the Coma Cluster consists of this still-mysterious dark matter. Lying south of Coma Berenices, and about 9° to the east (left) of Leo’s star Denebola, is the closer Virgo Cluster of galaxies. This sprawls across 8° of sky and holds about 1,500 galaxies at a distance of 54 million light years or so. 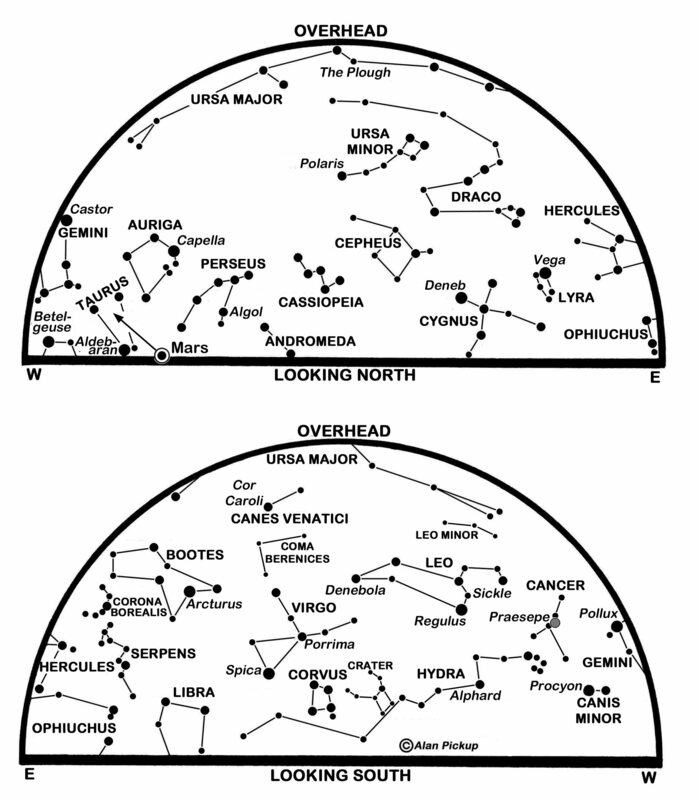 Small telescopes show several, though we’d struggle to locate them without a better chart than I can supply here. In fact, The Virgo Cluster lies at the heart of a much larger family of galaxies and galaxy clusters dubbed the Virgo Supercluster which includes the so-called Local Group of galaxies in which the Milky Way is a major player. 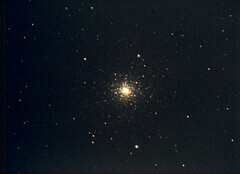 The Coma Cluster rules another supercluster. Edinburgh’s sunrise/sunset times change from 06:44/19:50 BST on the 1st to 05:32/20:49 on the 30th as the Moon stands at new on the 5th, first quarter on the 12th, full on the 19th and last quarter on the 26th. As I mentioned last time, satellites may now be spotted at any time of night though the current spell of evening passes by the International Space Station ends on or about the 5th. Mars stands some 30° high and alongside the Pleiades in our western sky as our nights begin at present. The planet, though, is tracking east-north-eastwards against the stars and passes north of Taurus’ main star, Aldebaran, to lie between the Bull’s horns later in the month. The young earthlit Moon is an impressive sight 9° below Mars on the 8th and stands above Aldebaran and to the left of Mars on the 9th. Mars no longer glares like an orange beacon in our sky and is now only half as bright as Aldebaran. As its distance grows from 302 million to 335 million km in April, it dims a little more from magnitude 1.5 to 1.6. Even large telescopes reveal little detail on its small ochre disk, less than 5 arcseconds in diameter, and viewing conditions can only deteriorate as it sinks towards the north-western horizon where it sets in the middle of the night. There are two brighter planets in our predawn sky, both of them low in the south to south-east as the Summer Triangle formed by Vega, Deneb and Altair climbs through the east. Jupiter, conspicuous at magnitude -2.2 to -2.5, rises in the south-east less than three hours after our map times and stands 11° above Edinburgh’s southern horizon before dawn. 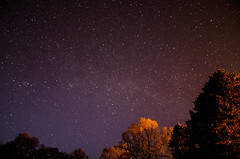 Slow-moving in southern Ophiuchus, it reaches a stationary point on the 10th when its motion appears to reverse from easterly to westerly as it begins to be overtaken by the Earth. Saturn, rather fainter at magnitude 0.6 to 0.5 and at its own stationary point on the 30th, lies in Sagittarius some 25° to Jupiter’s left. Catch the Moon near Jupiter on the 23rd and Saturn on the 25th. Although Venus is brilliant at magnitude -4.0, it rises in the east less than 38 minutes before sunrise and is unlikely to be noticed. Mercury is furthest west of the Sun (28°) on the 11th but is much fainter and lower still in the morning twilight. This is a slightly revised version, with added diary, of Alan’s article published in The Scotsman on March 30th 2019, with thanks to the newspaper for permission to republish here. 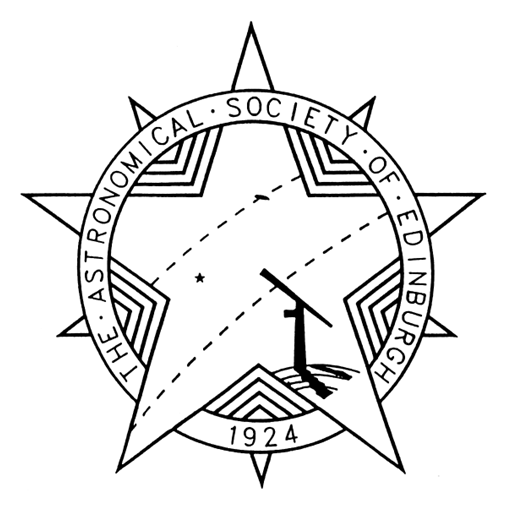 Posted on 30/03/2019, in Uncategorized and tagged Alan Pickup, Aldebaran, ASE, Astronomical Society of Edinburgh, Coma Berenices, diary, Fritz Zwicky, International Space Station, Jupiter, Mars, Mercury, milky way, moon, Night Sky, orion, satellites, Saturn, Scotland, The Scotsman, Venus, Virgo Cluster. Bookmark the permalink. Leave a comment. Alan PickupSteuart is/was mistaken. It was, indeed, on page 60 of The Scotsman. Steuart CampbellIt wasn't published today in The Scotsman! Image reproduced by kind permission.